Analysis: Other than headlines about how he had talked tough to allies and infuriated the foreign policy establishment, President Donald Trump didn’t really get much out of the NATO summit. 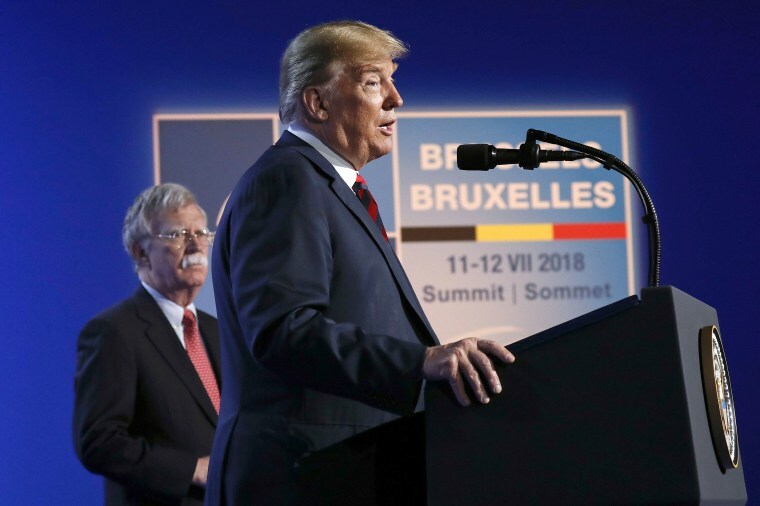 LONDON — It was a defeated version of President Donald Trump who abruptly rushed to the microphones at the tail end of a two-day NATO summit in Brussels Thursday to proclaim victory. The agreement secured by the deal-maker president is apparently the very one the 29 member nations had formally agreed to the day before. It doesn’t require, or even request, that countries spend 4 percent of their gross domestic protest on their own defense. It doesn’t condemn Germany for doing business with Russia. And it doesn’t gloss over Russia’s aggression in Ukraine or its interference in Western elections. That is, NATO wasn’t buying what Trump was selling. Other than headlines about how he had talked tough to NATO allies, and infuriated the foreign policy establishment in Washington and other capitals, Trump didn’t really get much out of the summit. The $33 billion in additional defense spending by NATO members that he cited at his Brussels press conference is the exact same figure he touted at a political rally in Montana last week. Have no doubt, Trump’s return to the campaign trail this summer is sure to feature anecdotes about him breezing into Brussels and wrangling NATO. But it was Trump who was ultimately brought to heel by the end of the summit. Western fears that Trump would fracture the alliance ahead of his meeting with Russian President Vladimir Putin seemed to be realized Wednesday as the American president wasted no time in calling Germany “captive” to Russia even before the official welcoming ceremony. A frustrated Trump went further when NATO officials actually met behind closed doors, first pushing them to double the agreed-upon goal for each nation’s defense spending and then all but threatening to walk away from America’s closest allies if they didn’t pony up. To put it mildly, the history of heavily militarized European states has not been good for those who appreciate peace. And while Trump’s predecessors have asked NATO members, including Germany, to show allegiance to the alliance by putting more money into their own defense, none of them have suggested the world and the U.S. might be better off without NATO. Of course, Trump’s supporters saw him as the big winner. 2008 Republican Vice Presidential nominee Sarah Palin tweeted out a report from her blog that held Trump got exactly what he wanted. Never mind that the 2 percent guideline was established in 2006 — or that other leaders more or less snickered at Trump’s 4 percent ask. Sources told NBC that Trump’s insistence on more spending was accompanied with a threat that the U.S. would “do our own thing” if his demands were not met. It’s not entirely clear what that meant, specifically, or whether Trump has the authority to pull the U.S. out of NATO without the approval of Congress. But what would that mean practically? Probably not much, as the U.S. contributes between one-fifth and one-quarter of NATO’s annual budget of about $2 billion. That’s a lot of money to some countries, but not to the U.S. or other top economies. After two Europe-centric world wars last century that proved impossible for the U.S. to avoid engaging in, and an ensuing Cold War that cost untold billions of dollars, few would argue that it’s in U.S. interests to abandon an alliance that has so far precluded war by one member nation against another. The point of NATO is not to provide the U.S. with physical protection — though allies have fought side by side with Americans — but rather to stabilize the world. Trump likes chaos, and he envisions a world in which each country’s interests are as clearly defined as its borders and economic and political accords are bilateral rather than multilateral. NATO is an impediment to that vision, but one he has little choice but to live with. Perhaps the U.S. wouldn’t feel repercussions from fracturing its military pact with smaller NATO members. But as long as other major Western democracies — Britain, France and Germany, in particular — are bought into NATO, it will remain strategically important to the U.S.
At a time when Trump accurately brags that he has built up American defense spending — and with so little U.S. money going directly to NATO operations — it’s a relatively small price to pay for peacekeeping. If the two-day summit revealed anything about Trump’s relationship with NATO, it’s that he can’t force partners to do his bidding — and that it still doesn’t make sense for the U.S. to leave the alliance.